CARLSBAD, Calif.—SPY® is happy to introduce the Happy 20 Collection—three limited edition styles designed to celebrate two decades of putting Happy smiles on the faces of people everywhere. Pushing the research and development envelope both technologically and aesthetically, the Happy 20 Collection includes three unique sunglasses featuring the Happy Lens™ that reaffirm where we started, where we’re at, and what the future holds. A limited edition collection, Happy 20 is built with recycled metals and SPY’s 100% biodegradable Plantate™ frame material. Additionally, all three Happy 20 styles feature SPY’s Happy Lens—a lens technology that lets in the sun’s “good” rays that studies suggest create an uplift in mood and alertness, while still blocking the sun’s “bad” rays. Paying homage to SPY heritage, the Fore is a full coverage classic wrap with aggressive styling and unique SPY bevels. A standout frame with a shape so distinct it could only live in the now, the Union is a medium-sized frame with lightweight temples to provide all-day comfort. Embodying our unusual approach in everything we do, the Heir is a fashion-forward sunglass featuring a strong bridge dip, unique temple shape and mixed materials. Hitting stores this week, the Happy 20 Collection will be available in Matte Black and Woodgrain frame colors and available with Platinum or Emerald Mirror Happy Lenses. MSRP for the Happy 20 Collection ranges from $130 to $170. 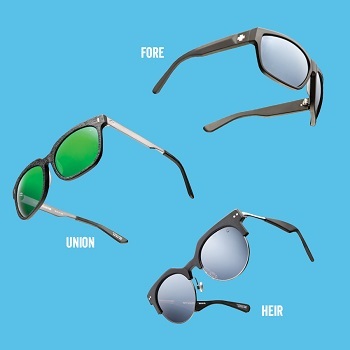 For more information about the Happy 20 Collection, go to www.spyoptic.com/happy20. To learn more about the SPY Happy Lens™, go towww.spyoptic.com/happy. For more information about SPY, log-on at www.spyoptic.com, www.facebook.com/spyoptic, Twitter @spyoptic and @spyoptic on Instagram.